Cooking in a pouch, while fancy in appearance, works quite well for a quick weeknight meal. 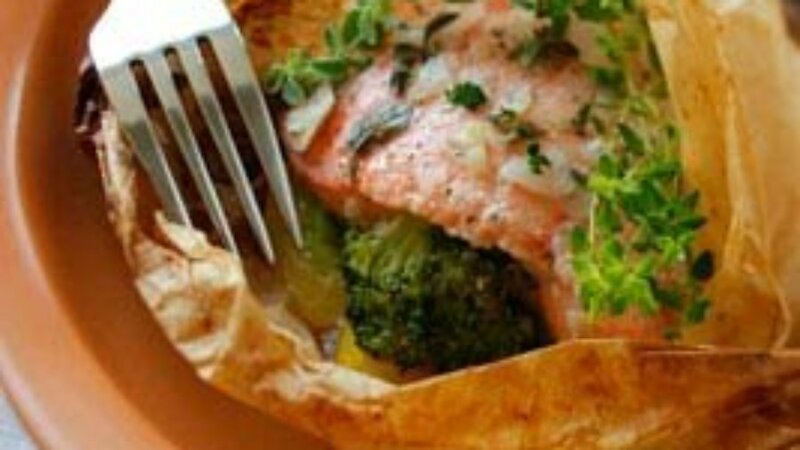 Simply pile vegetables and fish on a square of parchment or foil, seal and bake. The contents will steam and the flavors will blend. Serve with a mound of fluffy rice. You can adapt this recipe according to which fish and vegetables are at their seasonal peak. Preheat the oven to 400°F. Cut parchment paper or foil into four 12-inch squares and arrange them on a work surface. Fold each piece in half to form a crease down the middle. Divide squash between the squares, arranging it just to the right of each crease. Top squash with broccoli and garlic, then drizzle with olive oil and sprinkle with salt and pepper. Arrange one fillet on top of each pile of vegetables, then season fillets with salt and pepper. Top each fillet with an herb sprig and some of the chopped shallots. Drizzle lemon juice over fillets, then wrap up each square of paper or foil to form a sealed pouch. Transfer pouches to a baking sheet and bake until the fish is cooked through, about 20 minutes. Set aside to let cool for 3 to 4 minutes, then cut pouches open and serve immediately.